The hometown - and favoured - #5 seeded University of New Brunswick Varsity Reds will open their 2017 University Cup at 7PM on Thursday night against the #4 seeded Queen's Gaels, the OUA silver medalists. The Gaels University Cup experience is already off to an eventful start as their scheduled flight from Kingston to Fredericton today was cancelled due to the weather. As a result, the team is now taking a bus the entire way and is expected to be in town tomorrow. Despite this, head coach Brett Gibson, along with a few players and coaches, who arrived earlier in the week practiced today. As you can see from the picture above, they were a little undermanned. This will mark only the 3rd meeting all-time between the two schools and first at the University Cup. UNB won both previous encounters, a 4-3 OT pre-season win on October 11th, 1990 at the AUC and a 9-6 triumph on December 29th, 1993 at a tournament hosted by Concordia. The Gaels are back at the University Cup for the first time since 1981 and are the only team in the field who have yet to win a National Championship. They finished 3rd in the OUA East division after posting a 18-7-3 regular season record and then went 6-2 in winning their first three playoff rounds. They ultimately lost 4-3 to the York Lions in the Queen's Cup game last Saturday. In looking at Queen's stats, they closely resemble those of the York Lions, who UNB played in a pair of games over Christmas. The Gaels scored only 79 goals this season, which ranked only 25th (out of 35) in the country. Their 2.82 goals scored per game was well off the pace of the Varsity Reds country-leading 4.93. 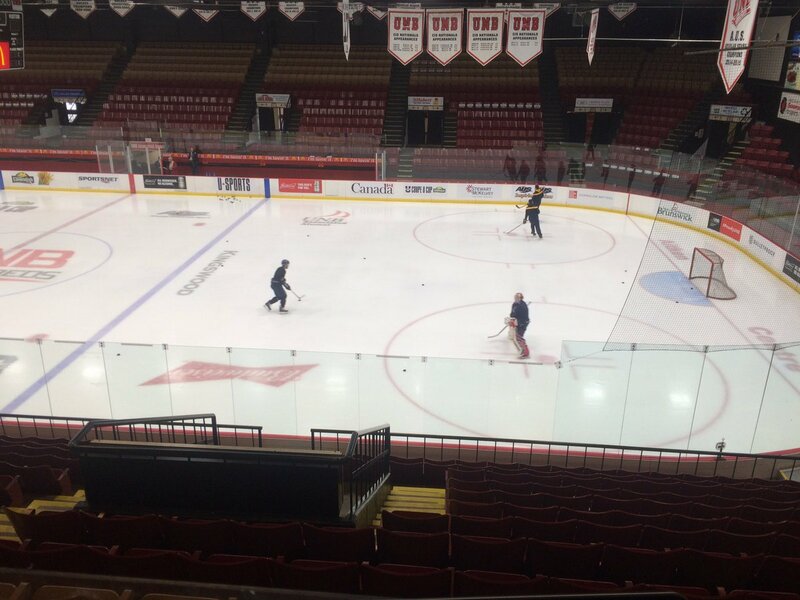 They also ranked in the bottom half of the country in averaging 30.7 shots per game, compared to UNB's 38.2. In fact, the Gaels have failed to record at least 20 shots on goal in 4 out of their last 5 games. However, like the Lions, they were one of the stingiest teams in the nation, only surrendering 2.37 goals per game and posting a 0.920 save percentage, which ranked them 6th and 3rd in the country, respectively. Of course, in addition to leading the country in goals per game, UNB also led the nation in goals against average at 1.90, although their save percentage was only 0.899. Perhaps the one thing Queen's does best is stay out of the penalty box, which could be key against the Varsity Reds lethal, albeit recently struggling, power play. The Gaels remarkably only accumulated 219 penalty minutes (or 7.82 per game) as a team this season, 99 fewer than the next lowest team. As a result, they were shorthanded only 74 times this season (61 fewer times than the next closest team) and gave up a U Sports-low 8 shorthanded goals. Their 89.2% penalty killing percentage ranked 3rd in the country, just behind UNB's 89.3%. By comparison, the V-Reds surrendered 18 power play goals in 169 shorthanded situations. Offensively, Queen's is very top-heavy. The trio of forwards Slater Doggett (13 goals, 20 assists and an OUA East second-team all-star), Eric Ming (13 goals, 15 assists), and Ryan Bloom (10 goals, 14 assists) accounted for over 45% of the team's goals. No one else on the team potted more than 5 and they only had nine players hit the 10 point plateau. On defense they are led by OUA East first-team all-star Spencer Abraham, who finished 4th on the team in scoring with 3 goals and 13 assists in 22 games. Team captain and New Maryland native Patrick Downe will get to finish his university hockey career in his hometown after chipping in 3 goals and 9 assists this season. As one would expect from a team that is as good defensively as the Gaels are, they have an outstanding goaltender. In fact, they have two. Kevin Bailie, the expected starter, has proven to be one of the finest in the country over the last few years and he put together another great season this year with a 2.31 goals against average and a 0.925 save percentage in 856 minutes. Meanwhile, Jacob Brennan was even better. The 2nd year native of Halifax put up a 2.08 GAA and 0.927 save percentage in 865 minutes. At the end of the day, this is a game the Varsity Reds should be heavily favoured to win. While Queen's has the unquestioned advantage in goal, the V-Reds offensive and defensive strength and depth should prove to be too much for the Golden Gaels to handle over the course of 60 minutes. Queen's has struggled all year putting the puck in the net, and more recently at generating many shots, and the Varsity Reds are the best in the country at keeping the puck out of the net and limiting shots, so it stands to reason the Gaels are going to have a really hard time scoring. 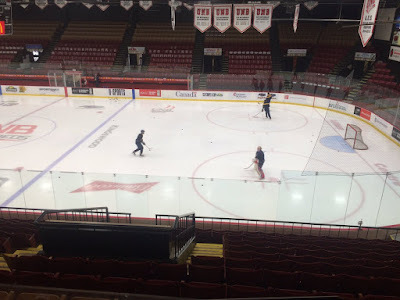 On the flip side, UNB puts more pucks on net than any other team and even with Bailie putting up his usual ridiculous numbers, given the sheer number of shots they will likely throw at the Queen's goalie, they should be able to sneak enough pucks past him to come away with the win. Having said that, in a single elimination tournament anything can happen and, as Saint Mary's and St. FX just showed, it isn't out of the realm of possibility for a team to score a couple of timely goals on their limited opportunities while also having their goaltender stand on his head and steal a game against UNB. Who do you got, UNB or Queen's?